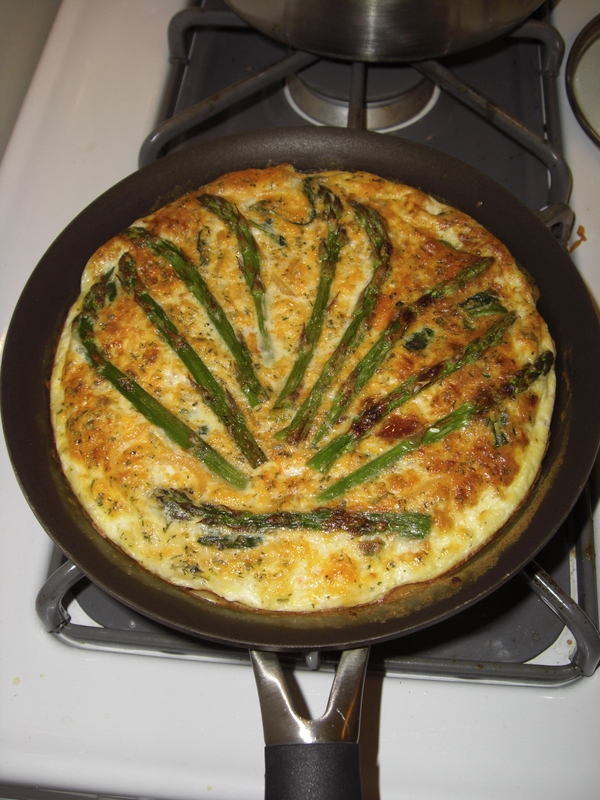 Steam or saute the asparagus and set aside. Quickly saute spinach until JUST wilted and set aside. Beat eggs and herbs until blended, adding a bit a few tablespoons of water to the mixture. Mix in cheese to the egg mixture. In a medium sized skillet saute onions with olive oil until just starting to become translucent. Add shallots, garlic and chorizo and cook until fragrant and onions are soft. In a small oven-safe pan, place the spinach and onion/chorizo blend and bring the heat up to medium. Stir in the egg/cheese mixture until well mixed and then let cook over medium heat until almost set. Press in the asparagus spears until just visible. Place in the oven on a high rack and broil until the top is golden brown. **NOTE** Be sure you cook the eggs long enough on the stove before transferring to the broiler! !